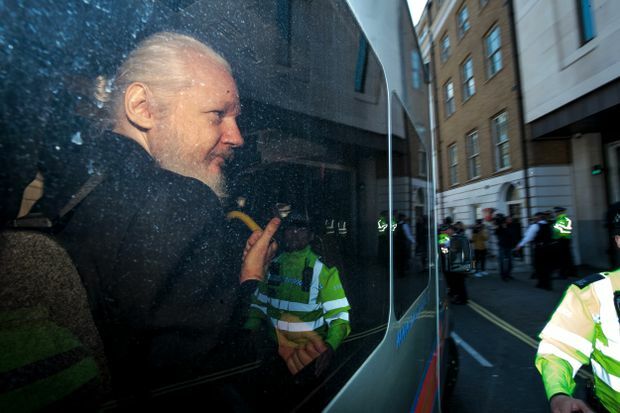 Julian Assange faces imprisonment in Britain and extradition to the United States after a tumultuous day that saw the Wikileaks founder arrested after losing the protection of the Ecuadoran government that had sheltered him for nearly seven years. 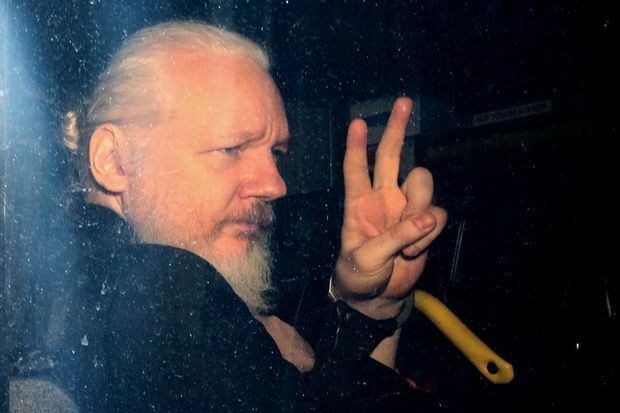 Mr. Assange had been holed up in the Ecuadoran embassy in London since June, 2012, when he was granted political asylum and shielded from arrest by British police who wanted him on charges of skipping bail in an extradition case involving allegations of sexual assault in Sweden. Mr. Assange had always argued that the Swedish case was really a cover to hand him over to U.S. authorities to face charges of stealing thousands of secret military files, including reports of atrocities by U.S. forces in Iraq and Afghanistan. On Thursday, Ecuador’s President Lenin Moreno turned on Mr. Assange, accusing him of mistreating staff, accessing embassy security files and threatening the government. “The patience of Ecuador has reached its limit on the behaviour of Mr Assange,” Mr. Moreno said in a video statement. He made the comments after clearing the way for London police officers to enter the building early Thursday morning and arrest the fugitive. Mr. Assange appeared dishevelled as officers dragged him out of the embassy and shoved him into a van while he shouted; “This is unlawful, I’m not leaving.” He faces 12 months in prison for the bail charge, and U.S. prosecutors quickly announced on Thursday that they will be seeking his extradition on a single charge of conspiracy to access confidential government files. However, prosecutors could add additional charges. Mr. Moreno has insisted he knew nothing about the U.S. case when he decided to end Mr. Assange’s protection. His arrest has unleashed a fierce debate about Wikileaks and whether Mr. Assange is a champion of free speech or a villain who steals secrets and puts lives at risk. He has long defended Wikileaks as a journalistic enterprise that publishes information in the public interest. But U.S. officials have argued that Mr. Assange is not a journalist or a whistle-blower but a political actor who uses stolen information. Britain’s opposition Labour Party joined in praising Mr. Assange and questioned his extradition. Labour MP Diane Abbott told the House of Commons on Thursday that, “Julian Assange is not being pursued to protect U.S. national security, he is being pursued because he has exposed wrongdoing by U.S. administrations and their military forces." Swedish officials also said they will consider reopening the sexual-assault case they dropped in 2017 after Mr. Assange skipped bail and hid in the Ecuadoran embassy to avoid extradition. British authorities had insisted for years that Mr. Assange would be arrested on the bail charge if he ever left the embassy. On Thursday, he appeared before Judge Michael Snow who quickly found Mr. Assange guilty on the bail charge. “His assertion that he has had not had a fair hearing is laughable,” the judge said in his ruling. “And his behaviour is that of a narcissist who cannot get past his own self-interest.” Mr. Assange will be sentenced next month and could spend 12 months in jail. If Sweden does reopen the case and seek Mr. Assange’s extradition, British Home Secretary Sajid Javid said it will be up to the court to decide whether Mr. Assange should be sent to Sweden or the United States. His bigger legal battle now looms in the United States, where he has been charged with conspiracy to commit computer intrusion. Prosecutors allege that Mr. Assange conspired with Chelsea Manning, a former U.S. Army intelligence officer who worked in Iraq and held a top-secret security clearance. In 2010, Ms. Manning downloaded more than 700,000 classified military reports and cables, and gave them to Mr. Assange who published the contents on Wikileaks. Among the material was a military video showing an Apache helicopter attack in Iraq in 2007 that killed a dozen civilians and two Reuters journalists. Mr. Assange and Ms. Manning also allegedly tried to break into Department of Defence computers to access secret documents, court filings allege. Ms. Manning was convicted on several charges of espionage and theft, and sentenced to 35 years in prison in 2010. She served seven years before president Barack Obama commuted her sentence in 2017. Mr. Assange has not been charged with espionage at this point and the charge that the United States announced Thursday carries a maximum sentence of five years. Mr. Assange has also been implicated in the Russian hacking scandal that rocked the 2016 U.S. presidential election. Wikileaks published thousands of stolen e-mails from the Hillary Clinton campaign and U.S. investigators believe the information came from Russian hackers. Mr. Assange has always insisted that he did not get the e-mails from Russians.